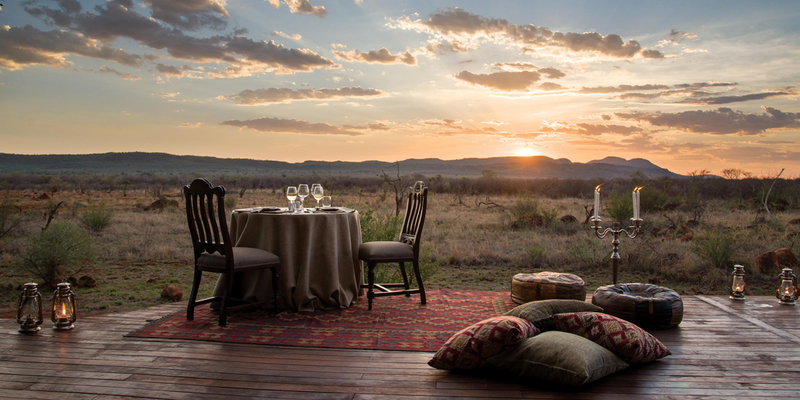 The impeccably designed Madikwe Hills provides the ultimate luxury safari experience in the heart of South Africa's malaria-free Madikwe Game Reserve. Situated on a rocky outcrop within the 75,000 hectare Reserve, Madikwe Hills is ingeniously built amongst boulders and ancient tamboti trees, designed to blend almost imperceptibly into the surroundings, with sweeping views of the Groot Marico River and miles of open plains. Despite being one of the nation’s largest reserves, development in the Madikwe Game Reserve has been closely monitored since opening in 1991. Guests at Madikwe Hills virtually have the place to themselves; day visitors are absent as driving on the game drive roads with personal vehicles is forbidden, and the relative remoteness and sense of escape is a huge part of Madikwe’s appeal. Madikwe Hills is perfectly positioned in the middle of the reserve, giving guests a huge game drive advantage over other lodges situated on the borders of the Reserve and offers visitors the most amazing South African safari adventure. Consisting of the Main Lodge and Little Madikwe Villa, Madikwe Hills can accommodate twenty-four guests in total. Nowhere else in South Africa can accommodate groups in such exclusivity and luxury, whilst also being able to experience a wealth of wildlife; resulting in the creation of a truly unforgettable, unique experience that far exceeds expectations. Madikwe Hills prides itself on its involvement in the local community, Molatedi Village, and contributes through financial support, building education centres, supplying food and clothing, developing skills, and creating jobs. Besides savouring the delights of the lodge itself, the game drives are an undisputed highlight of any visit to Madikwe Hills. All game drives and walking safaris are under the guidance of professional and experienced game rangers and guides. This is one of the few lodges in Madikwe Game Reserve that use ‘spotters’ on a tracker seat on the front of the safari vehicle. Madikwe is home not only to the Big Five - Lion, Elephant, Rhino, Buffalo and Leopard - but also to an abundance of other mammals, including the rare African wild dog, cheetah, giraffe, eland, kudu and a huge quantities of resident and migratory species of birds. Whilst on the game drives, guests with a passion for wildlife photography can gain various tips on taking the perfect safari picture from the dedicated ranger. Following an exhilarating game drive or walking safari, guests can relax and rejuvenate body and mind at the health spa and fully-equipped gym. Other facilities include a comfortable lounge with a bar and deck overlooking the waterhole, library, wine-cellar, curio shop and a swimming pool. Madikwe Hills specialises in paying meticulous attention to detail when organising special occasions for guests, with weddings in particular. Small intimate weddings for up to twenty-four guests are catered for at Madikwe Hills. Weddings in the heart of the African bushveld are an exceptionally unique event. This secluded environment and outstanding service is also ideal for corporate groups needing to get away and focus. The free internet and presentation facilities, and the outstanding, yet discreet, service ensures that corporate teams can stay focused on their work. Both the Main Lodge and Little Madikwe are child-friendly (children over ten years only at Main Lodge) and offer activities that are aimed specifically for children of all ages. These activities include face painting, treasure hunts, movie evenings, animal dung investigation and bug finding. A permanent child-minder is on hand for young family bookings, allowing guests time to truly indulge and relax, as well as precious family time. A reassuring fact for families with young children is that Madikwe Game Reserve is one of only a few areas in South Africa that is malaria-free. Madikwe Hills offers accommodation in ten luxury suites at the Main Lodge and two luxury suites at Little Madikwe Villa, giving up to twenty-four guests a private retreat within the Reserve. The vast, well-appointed and utterly private glass-fronted suites comprising the Main Lodge are scattered across the hillside, camouflaged by tamboti-beamed thatch roofs. Beautifully furnished and incredibly sumptuous, all suites have their own bedroom, dressing-room, bathroom with indoor and outdoor showers, lounge with fireplace, and a large private deck with private plunge pool offering the most exquisite views. The Honeymoon Suite features a stunning bathroom, accessed via an impressive flight of stairs, with a claw-foot bath tub built into a discreet outdoor corner for secluded soaks under African skies. Little Madikwe is a family-friendly, self-contained luxurious villa located separately from the Main Lodge, and comprises of a two-bedroom suite, accommodating four guests, with its own game drive vehicle, game ranger, and personal butler to take care of every need. The villa is complete with expansive viewing deck, swimming pool, underfloor heating, outdoor showers, private lounge and dining room, and sole-use kitchen with personal chef. Parents need not worry about their young ones disturbing the peace for other guests, as Little Madikwe Villa is also equipped with a satellite TV and DVD collection. Wooden walkways lit by hurricane lamps weave through the grounds and connect the secluded suites to the central open-plan lounge, bar, wine-cellar, library and dining area. The communal area also includes a large terrace and swimming pool with fabulous views. For those wanting to keep in touch with family members back home, there is an internet connection in the library. There is also a television for those wanting to keep up to date with the latest news or sports game.